Picture it. You oversleep, therefore the kids oversleep. You can’t seem to find two matching socks for anyone. You finally make it out the door, getting them to school just in time. Hours later, when it’s nearly too late, you notice them. The lunch boxes. Crap. I’m fortunate enough to live minutes from the school, so when this happens, I’m able to take forgotten items to The Kids. If I can’t however, I know that my children won’t go hungry. You see, the Richmond County Board of Education makes sure of this. They have hot lunches available for purchase every day. They are reasonably priced, and families can apply for free or reduced-price lunches, if they qualify financially. Forget to send a lunch or money, and the RCBOE will allow one charge, after which they send a notice home, asking for the account to be replenished. How do I know this? I have a letter, informing of the errors of my financial ways. It turns out that The Girl must’ve forgotten her drink a few times and needed to get milk. I’m not great about keeping money in her account, because she doesn’t buy lunch and prefers to take juice from home. By the time we got the letter, we were a whopping $1.50 in the hole, so I sent her with two one dollar bills to settle our milk debt. If the debts aren’t paid, and the child still forgets their lunch, they will be given a cheese or peanut butter and jelly sandwich, a fruit cup, and milk. To give credit to a few of the parents with multiple charges (ahem, you’re looking at one), the RCBOE isn’t all that great about notifying us about a low or empty account. An online system would make things a lot easier, and probably eliminate quite a few lingering arrears. ANYWAY. The whole system works pretty well, I think. There’s room for improvement, as with every process, but they do what they can. Imagine my surprise when I read a letter to the editor in the daily paper, written by a student’s aunt who was appalled by the treatment endured by her niece in the lunchroom at her elementary school. The student forgot her lunch and was forced to eat two slices of bread, a piece of cheese (um, a sandwich? 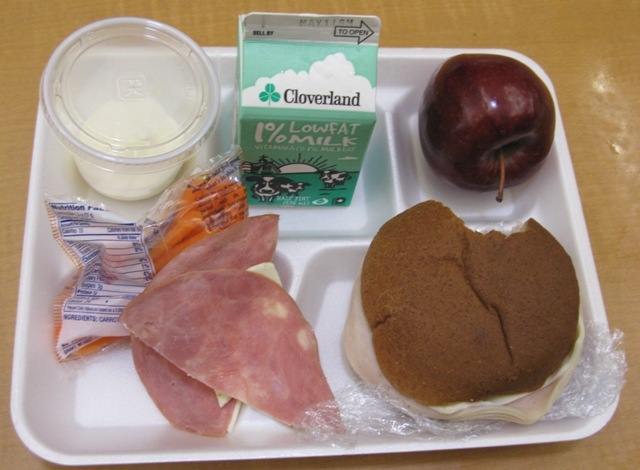 ), and a fruit cup, while her classmates ate a “substantial” lunch. Hey lady, here’s a newsflash for ya. That is a substantial lunch. My children take a sandwich, fruit, and a drink almost every single day, and they’re not on any nutritional watch list. Why is it the school’s fault that she forgot her lunch? I assume that she was sent to school by a guardian that morning. Why isn’t the guardian to blame? The school followed the procedure they promise. They will feed your child. It may not be a hot lunch, but it is lunch. Each day when The Kids get home, I ask them to tell me their worst and best parts of the school day. Last week, The Boy told me the worst part of his day was when he realized that he’d left his drink at home. He was forced to drink from the communal water fountain. Oh, the embarrassment. Not only will I send him with an emergency dollar from now on, but we’re accepting donations for Capri Suns and a psychologist. That’s going to be one hell of a therapy bill. ← Why bother parenting when you can stick ’em in front of Little House on the Prairie? The alternative I would give my kid is to not eat at all. Hunger is a powerful motivator, and they won’t starve between 12pm and dismissal, but they’ll remember lunch tomorrow. The child in question was fortunate that she was not my own. Oh my — complain-y adults like that make me NUTS! Today we got an email from the PTA that was similarly aggravating — our preschool is doing a shoe-drive for a local elementary school’s way-underpriveleged-kids. We had two weeks to fill in our pledge forms, which were sent to us as doc attachments via email. The deadline was extended TWICE because people couldn’t get it together in time to volunteer shoes. Fine. Who am I to judge? Well, I got a little judge-y today … when we got an email from the PTA, APOLOGIZING for making it so hard to volunteer. Apparently they had received complaints that downloading the doc (umm, clicking an attachment?) and printing it and then filling it out and returning it to school on time FOR TWO DEADLINE EXTENSIONS was “too difficult for people, and we totally understand — in the future you can just email us directly and we’ll fill out the forms FOR you.” Seriously? A bunch of adults can’t fill out their own forms? God forbid we raise our kids to grow into adults this useless … or adults who feel they have to apologize to useless people. Jeesh. Embarrassing! All of it! I have been to numerous places in other countries where the children are lucky to get a meal of rice and beans on Mondays and Wednesdays– and THAT’S IT! How about being grateful about living in a country where your child will get breakfast and lunch at school when needed! !